KAPALUA, Hawaii (AP) -- Gary Woodland wasn't making any putts until he chipped in for birdie, and then he couldn't miss. 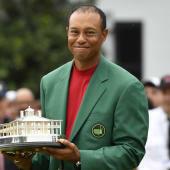 "The big deal was just staying patient on the greens," Woodland said. "It's very tough putting with the crosswinds and I didn't see anything go in early, but nice to see the chip go in on 11 and kind of got me going, propelled me for the rest of the round." Rory McIlroy had another good finish with three birdies over his last five holes for a 68, leaving him three shots behind along with Bryson DeChambeau (68) and Kevin Tway, who didn't make his first bogey at Kapalua until the 17th hole of the second round. He shot a 71. Defending champion Dustin Johnson had a 74, the first time in 33 rounds at Kapalua that he was over par. He could think of one shot he'd like to have back, out of the hazard left of the fourth fairway. The shot was fine. The trouble was it wasn't his ball, and Johnson was assessed a two-shot penalty. It didn't involve the new rules, although they might have played a role. If the ball moves while trying to identify it, there is no penalty. "It was way up in there (in the hazard), so I didn't want to move anything," Johnson said. "But I guess now understanding the new rule, if it moves it's not a penalty. So that won't ever happen again, I can promise you that. It's just bad luck." His wasn't the only blunder of the day. Justin Thomas was tied for the lead playing a short stretch of birdie holes when he took double bogey on the 14th hole and had to settle for a 72. Marc Leishman took a triple bogey on No. 6 -- one day after a double bogey -- and responded with six birdies over his last 12 holes to salvage a 70. He was four shots behind. DeChambeau's only mistake was not having an umbrella. Rain can show up unannounced on the west end of Maui, and there was a brief shower. He also was fooled at times by the wind, especially on the green. DeChambeau has a long checklist in his equation before shots, and the wind made that tough. "Guess you could say there was insufficient data," said the four-time winner and physics major. The putter has been frustrating over the years. He is starting to turn that into a strength, and said late last year that he found even when he wasn't making putts, he was about to. That was the case Friday. "We have done a lot of mechanical stuff, but the confidence is what really propelled me to have a good round today," he said. "Because in the past it would have been frustrating, just all day I would have been complaining about it." It also helps that he hasn't had much time off. This can be one of the easiest PGA Tour events to win all year because of the small field (34 players), many of whom have gone more than a month without competition. Woodland played in the Bahamas and the old Shark Shootout, and he kept practicing through the holidays. He did take his wife on a six-day vacation to the Dominican Republic. "I did, and I played the last two days down there," he said. "But I had a couple days off."